Near Port Canto at the eastern end of La Croisette, plage Zamenhoff is one of two beaches in Cannes in "regie municipal" which means that the city "manages" the beach and rents beach chairs, umbrellas and lockers at a much reduced rate. As in the other "regie municipal" beach, Plage Macé, there are no food or alcoholic beverages allowed. There's a nearby snack stand to buy sandwiches and soft drinks. There are toilets to use, changing rooms, lockers and hot showers. There are spaces reserved for the handicapped and a lifeguard is on duty. Normally, a reservation is not necessary. 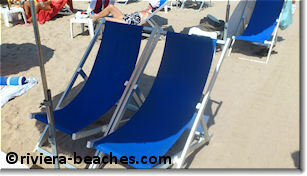 The beach holds 200 beach chairs. Normally, a reservation is not necessary. 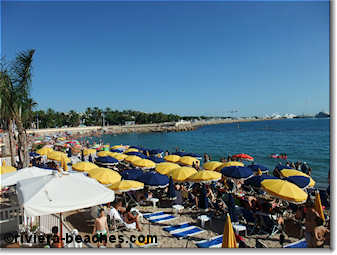 Zamenhoff is right near the Parc Croisette underground parking and bus line No 8 deposits you nearby. See more. Note that there are two sessions: a morning session that runs from 8.30am to 1.30pm and the afternoon session from 1.30pm to 6.30pm. Arriving at noon, for example, means you have to pay the fee for the full day.